Home Vaping Resources Guides Nicotine Salts: Fad or Future? Marketing also drives trends. Right now, the biggest name on the market – by a wide margin – is the Juul (read our review here). Its popularity is in part due to the sleek and compact nature of the device. Another reason for its popularity, however, is their patented formula of nicotine salt (nic salt) juice. The rise in nic salt popularity thanks to the Juul has bred competition in the vape market over a new hype product, one that is a bit different from normal vape juice. Nicotine salts are highly concentrated, but still smooth to hit. They deliver a unique vaping experience unlike traditional vape juices on the market. It’s not an experience every vaper will enjoy, though. Nic salts were developed originally for specific users and specific devices. So, what’s the hype for? Why are nic salts gaining in popularity, and who should be using them? We’ve covered some of the basics before, but let’s take a closer look at one of the vape industry’s growing trends, and the science behind why it’s catching on. The tobacco in cigarettes today is a manipulated version of the natural tobacco plant, developed in the 1960s. 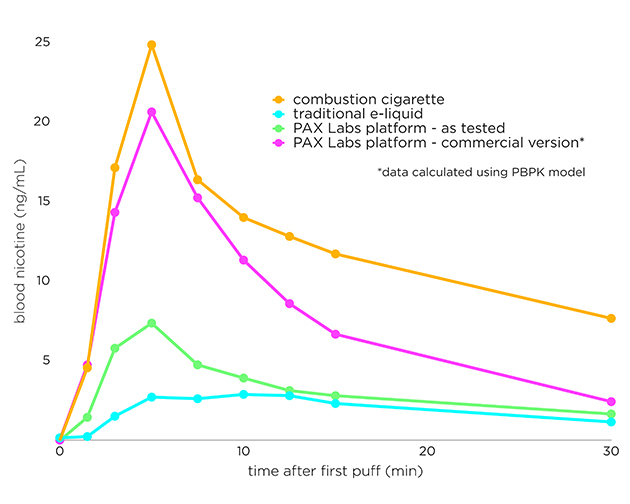 Scientists at big tobacco companies manipulate nicotine by removing the positive charge (de-protonating), creating what is known as “freebase” nicotine. Despite the connotation, the word freebase simply refers to a base chemical without any protons. Without protons, nicotine can more readily travel through our bodies, lungs, and brains. A higher level of bioavailability makes nicotine more potent and addictive. Higher end concentrations of freebase e-liquid typically available on the market reach about 24mg. If nic salt doesn’t travel through membranes as easily, though, how could using nic salt with vaping devices be as effective as cigarettes? One manufacturer has developed, and patented a solution, boasting 59mg nicotine and a smooth throat hit. Nicotine salts are designed with a specific user in mind. Folks using smaller, pod vapes looking for a full strength hit will benefit from using nic salt juice. For beginner users, especially those looking for a simple transition from and similar experience to combustible cigarettes, pod vapes with nic salt-based formulas may be the best option. DIY juice crafters may save money with higher levels of nicotine (though not above 18mg with a sub-ohm mod). Given Juul’s enormous market share, their nic salt vape pods are well-stocked in vape shops, tobacco retailers, and online stores (for now, at least. They still have to prove to the FDA that they’re only marketing to adult smokers). DIY vapers are crafting nic salt e-juices to keep for times when they want fewer pulls, or a harder nicotine hit. The community is divided on closed systems and “beginner gear” overall, however. Not everyone is so keen to jump on the salt bandwagon. The explosion of pod vapes on the scene has some die hard mod users offended. For some, vaping is a craft. Those who build their own mods, coils, mix juices, may not have the same interest in what is “big in the industry” right now. Everyday smokers, or vape users who want to have a quick “nic fix” on hand, however, stand to benefit from the advent of nic salt juices. So far the benefits outweigh the problems for nicotine salts, but we should be careful not to fetishize any product before we know enough about it.